Sure, Orlando has its world famous theme parks, but if you want to experience the real beauty and natural attractions of Central Florida, travel to Kissimmee. In this wonderful city of year round warm weather, you can indulge in the best of Florida’s history, arts, nature and family fun. If you want to see what life in Florida was like during the 1800s, the Kissimmee Historic District is the perfect place. Containing some 189 historic houses and buildings with various artifacts, this historic district gives you a good glimpse into the daily lives of the early settlers. Enjoy arts and culture in Kissimmee at the Osceola Center for the Arts. This award-winning center offers three different art galleries and presents live performances of Broadway series, ballet, concerts, musicals and more. Additionally, the center offers various classes and programs throughout the year for both children and adults. Whatever you do in Kissimmee, don’t miss out on a visit to Old Town, a one stop for exciting deals on dining, shopping and entertainment. In addition to several restaurants, many specialty shops and various amusement rides, this fun-filled street complex offers live music and dancing every night. On top of all that, Old Town hosts three exciting weekly events such as the Bike Nite on Thursday nights, the Friday Nite Cruise and the Saturday Nite Cruise where you can marvel more than 300 old, classic cars. While visiting Kissimmee, you can enjoy your pick of fabulous dinner theaters such as the Medieval Times. The Medieval Times features an arena where you can cheer on your favorite knight in competitions of jousting, javelin throwing and flag tossing while you indulge on tasty fare that includes spare ribs, roasted chicken and vegetable soup. Don’t miss out on a tour of the castle and village where you can see Medieval weapons, tools, crafts and even torture devices. For some sports action, head over to the Osceola County Stadium where you can catch a baseball game as well as other sports events throughout the year. The Silver Spurs Arena always has something exciting going on whether it be a sporting match, major concert or convention. The Osceola County Softball Complex offers five softball fields and presents numerous baseball and softball events every year. Additionally, in Kissimmee, you will find a wide range of miniature golf courses based on lively themes like pirates, Disney movies and the Congo River. 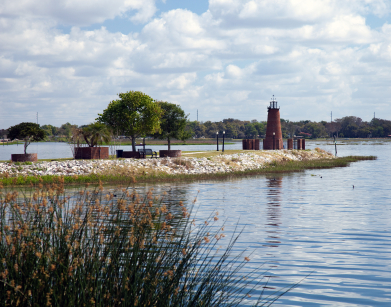 With many lakes, streams and swamps, Kissimmee packs many fun outdoor activities. Fishing lovers come to Kissimmee from all over the world to enjoy the thrill of catching a trophy bass or Australian barramundi in addition to crappie, catfish and bluegill. Besides fishing, you can also enjoy kayaking, canoeing and boating. With an abundance of woodlands, wetlands and conservation areas, Kissimmee also offers numerous hiking and nature trails where you can enjoy the beautiful unspoiled scenery and glimpse up to 35 different species of wildlife such alligators, deer and colorful birds. Bird lovers will be happy to know that Kissimmee is home to several species of rare and endangered bird species, including the largest nesting population of bald eagles in the continental United States. Are you ready to visit Kissimmee? Let HotelDealSite compare hotel prices for you today to find a fantastic bargain for you and your family.